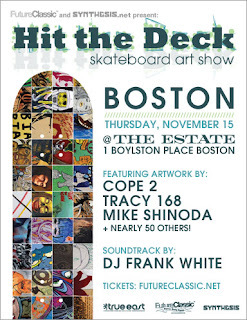 A group exhibition of world renowned clothing designers, graphic designers, graffiti writers, and established artists showing theiroriginal skateboard deck art. Presented by Future Classic, Synthesis, True East. FEATURING ONE-OF-A-KIND ORIGINAL SKATEBOARDS BY:Andy Regan, Buildmore, Nine Revolutions, Problak, Damion Silver, DanaWoulfe, Dave Tree, Elizabeth Clairwood, Fish Mcgill, Josh Falk, KenjiNakayama, Kim Lab, Kyle H. Bryant, Lichiban, Lisa Gilman, MarkShoening, Mitchell Kehe, Babak Khoshnoud, Nick Z, Rob Larsen, RyanLombardi, Percy Fortini Wright, Monk, Softies, Tim Zylicz, TakToyoshima aka Secret Asian Man, Yuko Adachi, Cope 2, Tracy 168,Miskeen, Matt Loomis, Alone 1, Kieth Shore, Society 07, Josh Taylor,Ben Kwok, Jason Brunson, Maria Gillespie, Colby Nichols, 2 Birds,Gabriel Hernandez, To Die For, Uncle C, Daven, Mike Shinoda, AbeAguilar, Chachi, Bishop, Matt Held, Andrew Jacob, Haidan Hodgson. SPONSORED BY SKYY VODKA AND SAPPORO! !